To award our best volunteer and also best customer, I proceeded to design a 3D badge (a materialized social badge yay!!) for both of them. Technical difficult made me essentially print the same one for both. I look forward to see Shapeways materials in gold plated, basics (prototype), and more. 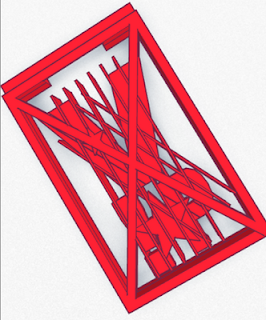 The actually design took 3 hours on TinkerCAD, but the trouble shooting and Tinkering took another 3 hours. Totally worth it. The lines that you see were originally supposed to be holes and carve ins so we can style up the letter. Unfortunately the TinkerCAD rendering wasn't perfect for it and Shapeways and iMaterialise didn't pick the changes up either then we went for all solid with minimum hole structures. Fun experience will make more but not until I see these in person.